Hello my dears I hope you are having a lovely Sunday. As the April Style post is a couple of days late (oops!) I decided I'm going to dedicate it to decorating with chevron. I've long been a fan of chevron decor but lately this obsession has stepped up a notch. In the past week I have ordered not one, but two chevron trays from Tilly Maison and they look fantastic! I actually have my eye on a couple more petite versions as they are a great size to store make-up and cosmetics. I've also decided that for our master bedroom I will be using the lovely Rubie Green Bryn fabric in buttery yellow for the curtains (which I'm going to attempt making). Jen Ramos, from Made by Girl has just released a some practical and stylish chevron calling cards which can be custom printed in your choice of colour and font. I think I will be going with the grey. 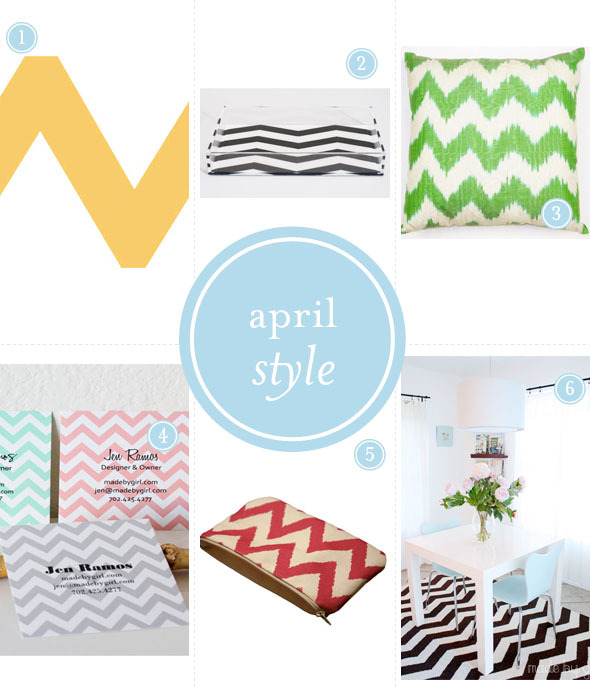 So, please let me indulge this April in my love for all things chevron. I've found a few favorites to share but I'd love to know if you have more great decor finds using chevron. I hope you are having a lovely and relaxing Sunday friends! Oh I love me some chevron too- so graphic and pretty. Loving chevron too! Tilly Maison trays are so fun and I love Jen's cards! I've died and gone to cheveron stripey HEAVEN! I'm completely obsessed with this pattern and I think I am on a mission to put it in every room in my house. Seriously. (c: Happy Monday! What a gorgeous post - Yes, I'm a fellow lover of the Chevron-ness!